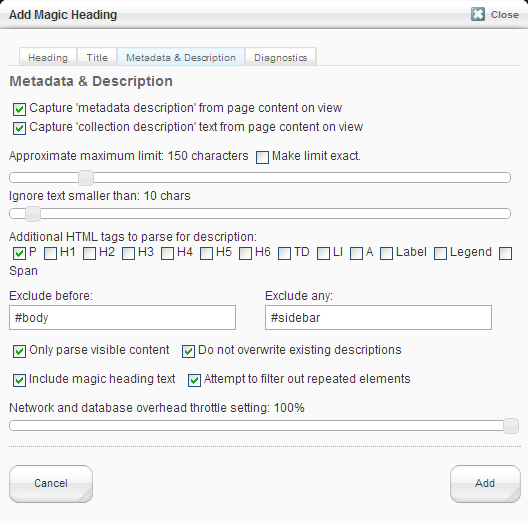 Easy creation and management of page titles, headings, descriptions and metadata. All of these play a role in SEO, yet keeping them up to date can become a chore that is often overlooked. Add a Magic Heading block to a page, or better still, add it to the page defaults or a global area and build the magic into an entire site. All your headings, titles, metadata and descriptions will magically stay consistent with your content. NEW in version 1.3: Facebook title and description metadata. Get Magic Heading and other tools to take take the strain out of managing your site in the Lazy Webmaster bundle or Lazy Webmaster Plus bundle. Insert a heading based on the page name, title, path, or user entered text. Change the browser tab title to match the page name, title, path, or user entered text. 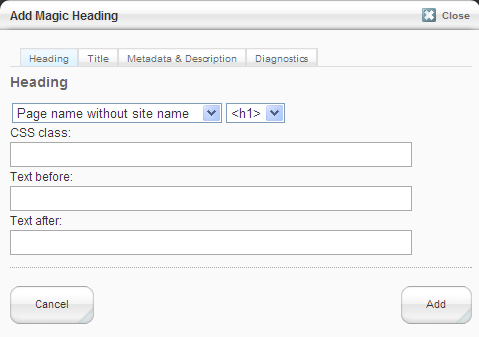 Write the title back to the page meta_title attribute. Parse the page to extract a description, and write that back to the page meta_description and/or C5 collection description. Set Facebook title and description metadata. Each of these actions is highly configurable and optional. Adding a new page is a bit of a chicken and egg thing. 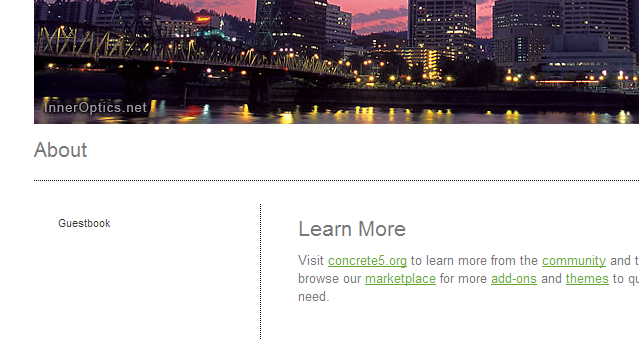 You create a page with a name and path, but don’t yet know enough to write the description or meta-data. Then you edit the page and enter a heading, usually the same as the page name, write some content, then use the first few sentences of the content to go back and write the meta-data and description. 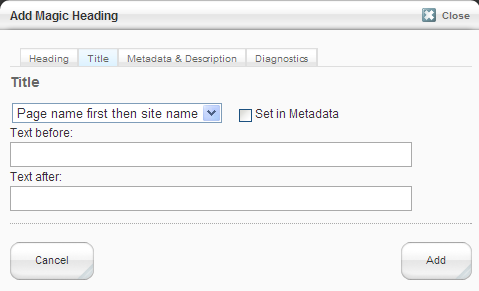 Then when you change the content, you have to remember to go back and change the meta-data and descriptions again. Or, like me, you are lazy and let the description and meta-data get out of date. Magic heading takes all the hassle out of this. 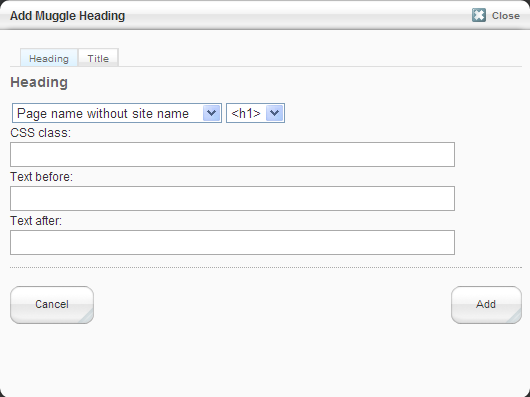 Add a Magic Heading to a page and the heading and browser title tab will automatically reflect the page name. 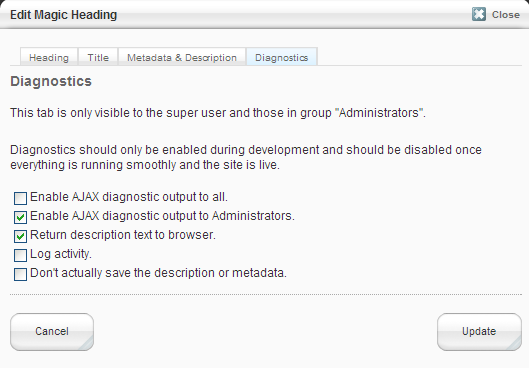 The page will be analysed and the metadata and description will be automatically generated from the page. It saves time when added to any individual page, so think of how much time it saves when added to page defaults or a global area, with every new page instantly having a heading to match the page name and all that meta-data and description text being magically added across an entire site. Think of how much more time it saves whenever you edit pages. If all this is too much for some of your site editors, a reduced functionality Muggle Heading block strips out all the complicated bits and simply sets a heading and/or title for the page. See the Documentation for more details of configuring Magic Heading to get the best results for your pages.